API POND ACCU-CLEAR Pond Water Clarifier quickly eliminates cloudy pond water caused by dirt, silt and floating particles. This fast-working pond cleaner works by aggregating tiny suspended particles in pond water to form larger clusters which fall to the bottom of the pond or are removed by the pond filter. 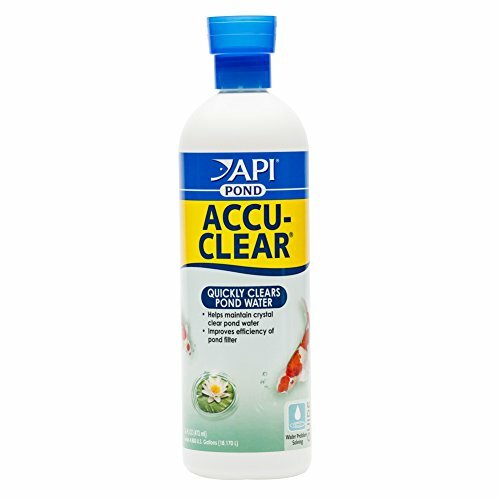 API POND ACCU-CLEAR rapidly clears cloudy pond water and improves the efficiency of the pond filter. Exclusively for freshwater ponds, this solution can be used weekly or whenever cloudy water is observed. Be sure to use as directed for best results. With API POND products, it’s easy to keep a beautiful pond. For over 50 years, API has been creating innovative, research-driven solutions that make it easier to care for your pond. API POND Pond Treatment Supplies are designed to work in conjunction with each other to provide best results to control algae, promote healthy bacterial growth and help control and cure fish diseases and conditions such as ich and fin rot. They work to provide a safe, hospitable environment for fish such as koi, catfish, perch, goldfish and more. With API, you can spend more time admiring your fish, and less time scrubbing your pond. Make sure to use all products as directed in order to ensure the best results.